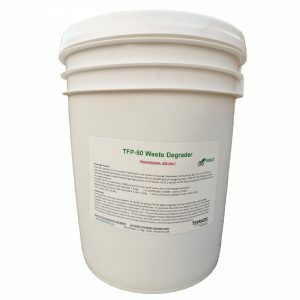 TFP-50 contains bacteria that are capable of producing extremely high levels of enzymes necessary for the rapid breakdown and solublisation of various wastes (substrates) such as fats, oils, grease, cellulosic fibres and petroloium hydrocarbons resulting in solids reduction and wastewater clarification. Quickly and efficiently goes to work on removing organic, and inorganic buildup from water treatment systems. TERRADIS products are effective in a variety of applications including Chemical Plants, Refineries, Municipal Wastewater Treatment Plants, Retention Ponds and Lagoons, Food Processing Plants and Water Recycling Systems including Frac Water Recycling for Oil & Gas. 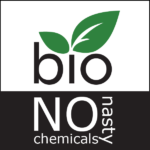 Our specially designed biochemical formulations allow water to be recycled or treated, then discharged without damage to the environment. TERRADIS products contain scientifically selected and adapted bacteria, enzymes, and nutrients formulated for the biodegradation of a myriad of organic compounds found in industrial, commercial and agricultural systems. Our bacteria produce extremely high levels of enzymes necessary for the rapid breakdown and solublization of various wastes (substrates) such as petroleum hydrocarbons, fats, oils, grease, and cellulosic fibers to facilitate solids reduction and wastewater clarification. One example, Ultra-BHD, is specifically formulated to work in oil refinery wastewaters and on soils contaminated with petroleum distillates. The product is also well suited to degrading organic compounds such as crude oil, gasoline, diesel fuel, BTXE’S, surfactants, amines, alcohols, esters, ketones, phenols, and aromatic hydrocarbons. TERRADIS products contain scientifically selected and adapted bacteria, enzymes, and nutrients formulated for the biodegradation of a myriad of organic compounds found in municipal, commercial, agricultural, and industrial systems. Our bacteria produce extremely high levels of enzymes necessary for the rapid breakdown and solubilization of various wastes (substrates) such as fats, oils, grease, cellulosic fibers, and petroleum hydrocarbons to facilitate solids reduction and wastewater clarification. One example, TRBC-500 WSP, is formulated to inhibit the biological production of odors caused by gases (H2S, etc.) and putrid, volatile organic compounds usually associated with anaerobic conditions.